Crown lengthening (or crown exposure) is required when your tooth needs a new crown or other restoration.The edge of that restoration is deep below the gum tissue and not accessible.It is also usually too close to the bone or below the bone. The procedure involves adjusting the level of the gum tissue and bone around the tooth in question to create a new gum-to–tooth relationship. 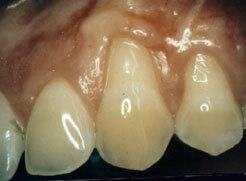 This allows us to reach the edge of the restoration, ensuring a proper fit to the tooth. It should also provide enough tooth structure so the new restoration will not come loose in the future.This allows you to clean the edge of the restoration when you brush and floss to prevent decay and gum disease.The procedure takes approximately one hour. When the procedure is completed, sutures, and a protective bandage are placed to help secure the new gum-to-tooth relationship.You will need to be seen in one or two weeks to remove the sutures and evaluate your healing. Traditionally, eliminating the gum pockets by trimming away the infected gum tissue and by re-contouring the uneven bone tissue treats gum disease. Although this is still an effective way of treating gum disease, new and more sophisticated procedures are used routinely today. Guided tissue bone regeneration regenerates the previously lost gum and bone tissue. The bone added to these defects is usually obtained from a tissue bank or from your own bone. Most techniques utilize special membranes that are inserted over the bone defects to encourage bone and tissue regeneration. Some of these membranes are bio-absorbable and some require removal. Other regenerative procedures involve the use of bioactive gels. These procedures are a predictable way to cover unsightly, sensitive, or exposed root surfaces and to prevent future gum recession. If you are unhappy with the appearance of short unsightly teeth this can be greatly improved by a combination of periodontal procedures and cosmetic dentistry by Dr. Graef or Dr. Richardson. Tooth loss causes the jaw bone to recede and can lead to an unnatural looking indentation in your gums and jaw, an appearance of a general aging. 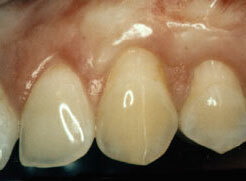 The original look of your mouth may not be recaptured because of spaces remaining under and between replacement teeth. They may appear too long compared to nearby teeth. For more information about Periodontal Surgical Procedures, or to schedule an appointment, please call our office: 248-589-2021.